Sometimes our imagination takes us to crazy places. Only a few are bold enough to follow through on this path, and only a select few (are mad enough) have the guts to bring these crazy fantasies to reality. This is exactly what the following Surfboard inventors did. They shared their weird surfboard and water craft ideas with the world by bringing them from the realm of imagination to reality. Jet Surf Nation presents The Craziest Jet Surfing and Watersports Inventions of 2017! With the reality of global warming and climate change affecting our world, inventors are now looking at ways to improve our use of energy and fuels, making things cleaner and more efficient. This has spilled over into the water craft industry, and we now have machines like the Solarboat which are built to specifically run on solar energy. Making our world cleaner and still having at the same time! Seabob is a water sled that utilizes an E-jet power system which works with the principle of displacement; where water is sucked in by a super strong rotating impeller and forced out through the channel under high pressure. This produces a wave riding motion (i.e. bobbing up and down, maybe that’s where the “bob” name came from) giving the rider a thrilling water experience. The Seabob not only allows you to have fun on the surface, but also gives you the opportunity to dive deep into the water. It permits the rider to reach depths of up to 40 meters! Of course, you have to be a real good swimmer to try this one out… With its impressive zero emission engine and its light weight of about 38kg and high degree maneuverability, it is ideally suited for spins, stunts and use in large pool complexes. So for water loving people who want to have intense fun on the surface and in the depths of the water, this water sled just might be the right crazy toy for you! This is a completely different ball game here. We are talking about a submersible watercraft that is built to resemble a shark. One look at this machine and you’d know where the inspiration came from. It is capable of going into the water and jumping out just like a shark! The Seabreacher has a portable cooling unit, vectored jet nozzle for maneuverability and high performance wings and elevators. It is 5.81meters in length with a width of 0.9meters. The Seabreacher is powered by a 260hp supercharged engine with a fuel capacity of 14 gallons. If you love sharks and have probably seen all the crazy shark movies out there including Sharknado, then maybe it’s time to take your love for these dangerous creatures to the next level and cruise on water like your favorite sea animal with the help of the Seabreacher! Coming in at number 8, we have the mirage eclipse. What looks to me like the ultimate lazy man’s waterboard. This is a leg powered water craft closely resembles a bicycle in terms of the mechanism utilized for propulsion except that this time it’s on water. It has pedals which serve to propel it in the direction the user chooses, and it seems quite easy to operate. If you’re used to riding a bicycle you should have no problems here. The pedal board is fairly new stuff, and the Mirage Eclipse is not only good for drifting on water, but it also doubles up as a fisherman’s board! If it becomes widely adopted, this might not only change the way people surf, but it may also revolutionize the fishing industry! Coming in at number 7, we have the Jetovator. This is another crazy personal watercraft that enables you fly over water and inside water too! Yup! You heard me right. Jetovator can be used to soar above water and go deep into the water (up to 10 feet), you may want to pack a scuba gear along for this one. Its control simplicity gives room for lots of crazy maneuvers and stunts. Want something portable and adventurous that won’t kill your bank account? Taking portability to the next level, the Bomboard is capable of being dismantled into 4 components and easily reassembled. It is also crazy enough to allow you assume 3 different positions while riding: sitting, kneeling or standing. Just kidding! Each position on the craft is designed to go along with the rider’s level of experience. Did I mention that humans are obsessed with flying? The Jetlev further helps to bolster my argument. This is a water based jet pack that utilizes a propulsion engine and fuel system. It makes use of water as its jet propulsion medium. Jetlev claims it has incorporated many safety features that are guaranteed to minimize the risk of accidents. Stuff like protective backrest and head support act as cushion in case of a fall. This is some insanely crazy stuff! I’m not so sure I’d try this, but if your curiosity leads you down this route, then who am I to stop ya? Go ahead and bring those superman and ironman airborne fantasies to life with Jetlev! Is this what the developers were thinking?? And the synthesis of surfing and sailing is a crazy idea that a lot of ocean adventurers fancy, so it’s no surprise that this is gradually becoming the norm. In an attempt to redefine the way we surf, Switzerland company Wokart is focused on making surfing feel like driving. Man is a terrestrial creature by nature, and we have dominated the land with our cars and automobiles, why not copy the exact same concept and apply it to water instead? Wokart gives you the opportunity to do just that. With a 70hp engine and top speeds of 75km/h, this vehicle allows you to drive instead of surf on water. If you’re a surf novice, then this crazy water toy enables you to do something you’re familiar with in an unfamiliar environment, a good way to test out your ocean tolerance eh? Many people don’t know this, but 3D printing tech has been around since the 1980’s! It only just got popularized more recently due to advancement in technology. 3D printing has helped in various areas of human endeavor including housing and fashion (that’s right they’re 3D printed clothes and shoes). Someone felt that 3D printing should extend its helping hand to the surf industry …and then vola! We now have 3D printed surfboards. With the aid of a computer, the 3D digital surfboard model is created and designed piece by piece. The exact dimension is then used to print a life sized surfboard. This is still relatively new and we can’t really vouch for the practicality of the 3D printed surfboard, but since it uses standard dimensions and materials then all should go well… *fingers crossed! Well… For those who don’t know, a hydrofoil is a lifting surface or foil that operates on water (quoting Wikipedia directly). Here, we have a hydrofoil that operates in water and midair simultaneously! Now, nobody knows why someone decided this board was going to be a thing, but I guess that is what happens with crazy ideas like this, you don’t ask too many questions, just have fun!! The 10 foot hydrofoil is basically a surfboard that lets you surf and fly at the same time, so if this is somehow one of your little fantasies, then this weird machine has you covered. 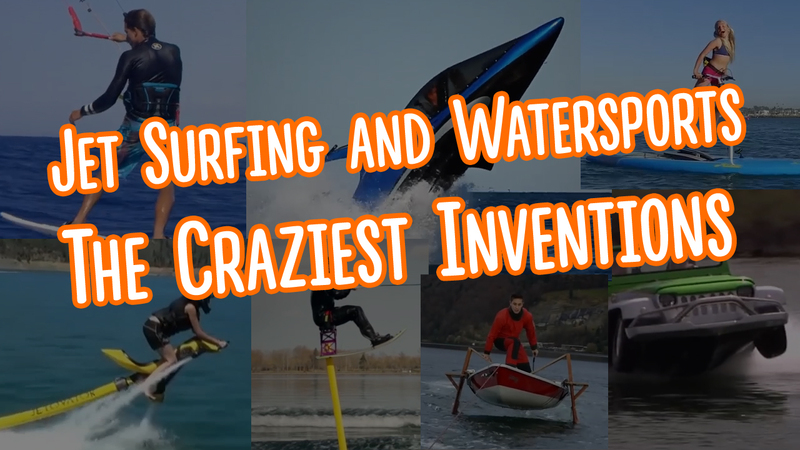 And there you have it, Jetsurf Nation’s craziest Jetsurf and water sport inventions! There are some many crazy water crafts out there we can’t possibly cover everything. Here’s a bonus craft that didn’t’ make our list, but we just couldn’t pass this up! Okay, so this unconventional inventor decided to take crazy to the next level. A surfboat shaped like a spider walking on water isn’t something a regular guy dreams up, but here we have it, a hydrofoil Spiderboat! Although it doesn’t look very stable, I suspect it would be fun to try out. Our second bonus crazy water craft is the self-proclaimed most fun vehicle on the planet — The Watercar! Now, if you look at this and think that you are just starring at an ordinary car, then I’ve got news for you; You Are WRONG! The Watercar for all we know might resemble a jeep, but don’t be fooled by its familiar appearance, it is no ordinary vehicle. It is an amphibian capable of dominating both terrestrial and aquatic environments. Incorporating a durable light weight fiber glass body and the very reliable Honda V-6 engine, Watercar is not only crazy, it is also amazing! Could the developers be right? Is this the most fun vehicle on the planet? I’m not gonna answer that, you’d have to give it a spin to find out. Crazy isn’t always bad… if anything, these inventions prove that sometimes there can be real innovation if you are willing to take the risk and venture into the realm of out of the boxing thinking and a little bit of insanity…hehe..